A month ago, we noted small improvements in market psychology and the trend seems to have extended itself. While there are no questions about it, we are dealing with a "sick" equity market. The lack of faith in the system and its participants has taken a toll on Wall Street. The financial and emotional pain will be felt for years to come. However, it seems as though a majority of the panicked retail investors have already bailed on the markets. In the long run, this may prove to be a financially devastating decision on their part, but for those that were able to cope with the ups and downs (mostly downs) of the market may find comfort in knowing that the panic selling is beginning to dry up. In fact, the equity markets have behaved surprisingly well in the face of less than appealing economic data and news. Such resiliency leads us to believe that the markets may be in store for a rather large technical rally in the coming weeks. Along with the premise that there are simply too many bears and all of the sellers have reacted to the environment, there seems to be a substantial amount of euphoria surrounding the potential impact of a new White House administration. Whether you support the President elect's policies or not, you can't deny the optimism surrounding his economic team. Whether the so-called dream team will be able to deliver is another story, but as long as investors maintain a positive outlook stocks should temporarily benefit. We have continually noted the large amount of cash reserves waiting to be put to work in equities; conversely, it seems as though investors opted for Treasuries instead. Nonetheless, the potential for bull market chasers still exists. Should equities finally show signs of recovery from one of the biggest bears in history, money allocated to cash and Treasuries will find its way back to Wall Street. The result will be a massive short squeeze and perhaps a return to stability in equities. The timing of this portfolio shift is uncertain, but if stocks can gain enough ground going into month's end we may see the beginning of such a phenomenon. If the rally fizzles, it may not occur until well into 2009. 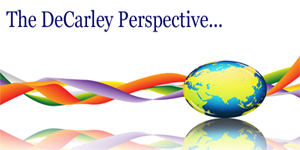 In last month's newsletter, we were accurate on the overall direction of the market but overestimated the magnitude of the rally. While the buying fell short last time around, this time may be different in that the light volume surrounding Holiday markets often exaggerate moves. Based on early December trade, it seems as though light volume favors the upside and we have plenty of light trading ahead of us. Assuming the auto bailout fiasco comes to a timely and productive closure, we still believe in a possible rally to just under 10,000 in the Dow by early next year, our first target in the NASDAQ is 1361 but 1521 is possible in the coming months. 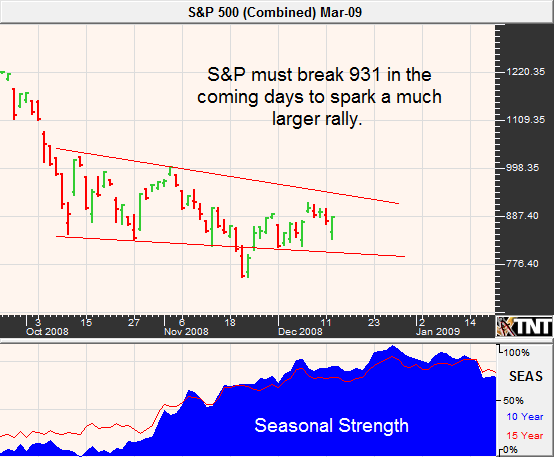 The S&P is facing significant resistance near 930 but a break of this level could mean 1000 in short order. If you have been following our newsletter, The Stock Index Report, you have likely noticed that we have reduced the risk involved with our trading recommendations. Instead of being net option sellers, we have temporarily converted our strategy to long option plays and have had some success thanks to the volatility. As we become more comfortable with a short option strategy in this evolving environment, it will be business as usual. Watch for updates in The Stock Index Report. Our previous projections and analysis failed to incorporate fear. Retail investors have come to the conclusion that they are content with simply knowing that they will get their principal back as opposed to earning a return. Suddenly, yields aren't playing a large role in investment allocation; default risk has taken over. Accordingly, yields on the long bond are hovering around 3% while the 10-year note sits near 2.5%. T-Bills on the other hand are returning 0.01% to investors, but this is slightly better than the intraday yields in negative territory. Eventually, investors will regain an appetite for risk and corporate bonds are becoming a very attractive target. Many corporate bonds have become ridiculously cheap to pump yields to unbelievable levels. As the Financial Armageddon theme fades, we could see a large amount of capital move from Treasuries to corporate backed bonds. Once this happens, the downdraft in government backed fixed income securities could be surprisingly swift. With rationality out of the way, we are forced to look at technical patterns and market seasonality. December is known for being a turnaround month for bond traders. It is not uncommon for a large Treasury rally to come to a dramatic end in mid-December. However, my instinct tells me that the trend reversal will be a little late this year. With current prices "off of the charts" and outside of my previous scopes of possibility, I have a little less confidence in my analysis. However, I believe that the recent consolidation range was the market preparing for another move higher. 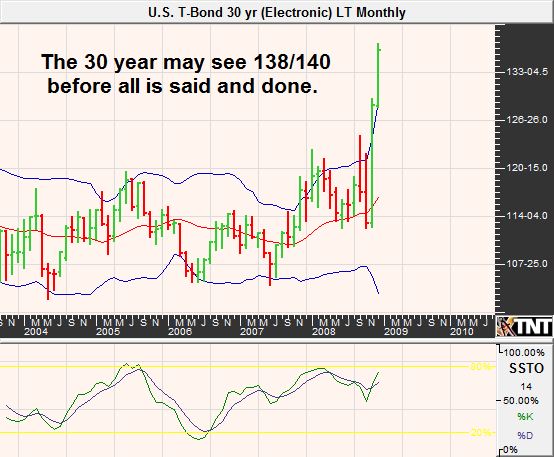 My first target in the 30-year bond is 138, but I see the possibility for prices just under 140. The 10-year note could see prices as high as 129 before a long awaited reversal occurs. With that said, if my predictions become reality it will do so in the near-term and will likely be a relatively quick rise and even quicker fall from grace. Stay tuned to the Bond Bulletin for ideas on how to play this market. Commodity prices have suffered at the hand of the global recession and sharp reductions in demand, not to mention speculation of even sharper reductions in demand. It is clear that the entire commodity complex is in the middle of a downdraft and has been part of one of the largest deflationary moves in history. However, while the grain complex is beginning to look "cheap" relative to the 2008 highs we remind you that on a historical basis they are still at moderately high prices. Nonetheless, some well-known analysts are looking for a sharp short covering rally by month's end and others are set on the short squeeze occurring in early 2009. We tend to believe that the move will occur in tandem with the U.S. dollar correction that could begin within the next week or two based on seasonal evaluation of the currency but as late as mid-December according to grain tendencies. Remember, timing is everything and that is what makes trading commodities challenging. The grain short covering rally, and dollar correction mentioned above are now underway but there are questions regarding the duration of the move. We feel as though the dollar correction hasn't run its course, this should provide temporary support to the grain complex. With that in mind, it seems as though the underlying trend of commodities will continue to weigh on prices in the longer term. In fact, many analysts are expecting that commodity prices will fall below the cost of production before demand (and the economy) will be able to spring back. Just as the financial markets are having difficulty putting a price tag on assets, the commodity markets are struggling to find an equilibrium value during the financial crisis. Corn futures closed above their 20-day moving average on Friday, suggesting that the current short covering rally may have a little room to move on the upside. Conversely, we have our doubts that the rally will hold. Instead, we believe that the downtrend will eventually resume as demand is questionable and USDA data suggests that supplies are slightly better than what was originally expected. The ethanol story still seems to be providing the market with moderate support, but we argue that there are far more efficient means of producing the fuel. Similarly, the Federal government may look to abolish its ethanol mandate in light of the soaring deficit. This year, the money to be made in corn may be to the downside. Soybean fundamentals are much more promising than that of corn, therefore if the grain complex is in store for a rally it will likely be led by beans. USDA estimates of 2009/2009 ending stocks are nearly identical to that of the 2007/2008 numbers. Thus, according to available information the domestic supply picture appears to be somewhat challenged. Additionally, demand remains stable. The supply/demand picture as well as seasonal strength seems to be enough to overcome the technical resistance facing bean prices in the near term. 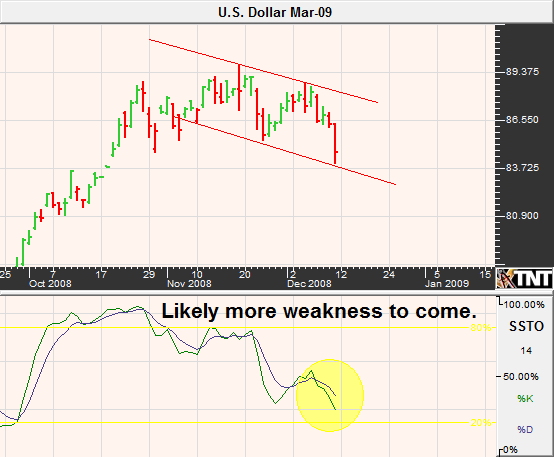 Similarly, the U.S. dollar appears to be in corrective mode and should continue lower for the time being. 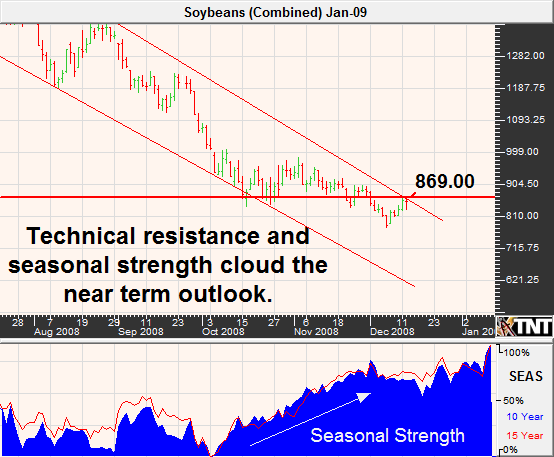 If January soybeans can close above major resistance at $8.69, a rally to $9.25 could follow. 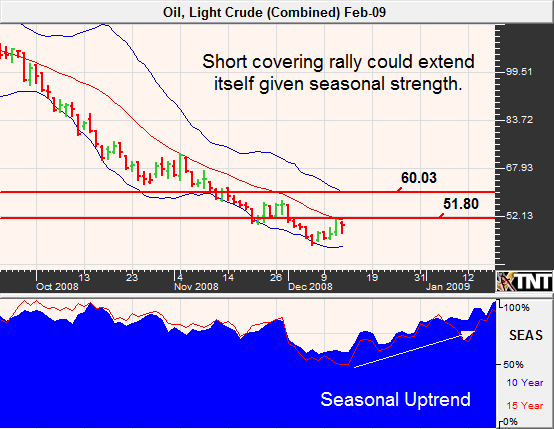 Also spurring the near-term bullish tilt, crude oil prices have been on an uptick. A recovery in the energy complex should have a positive impact on grain prices as commodity trade seems to be more closely tied to inter-market relationships than it is to individual market fundamentals. However, we don't expect soybeans to have enough momentum to trade much above the noted levels at $9.25. This is especially true considering our doubts of the U.S. Dollar to trade under 81.00. Wheat trading above $5 per bushel is a far cry from the $13 witnessed earlier in the year but is still extremely high considering its previous price envelope. Prior to the 2007/2008 commodity rally, wheat prices spent a majority of the time trading comfortably between $2 and $4 per bushel. Therefore, as cheap as it seems at $5, it isn't necessarily so. It is important to notethat the demand for wheat is much more inelastic than that of some of the other consumable commodities in that it wheat products tend to be much less expensive. In fact, consumers typically allocate more of their grocery budget to cheap carbohydrates and away from proteins. This behavioral change indirectly has a negative impact on the demand for corn and bean products which are often used as animal feed. Therefore, when it comes to this grain the outlook seems to be more dependent on supply factors than demand. As of now, the 2008/2009 U.S. wheat stocks look to be vulnerable to a further decline in thedollar and world production is anticipated to be lower than the previous year. Spread trade may eventually benefit wheat prices. Insiders are noting several traders buying corn and selling wheat which may have been the contributing factor to the recent wheat dip. 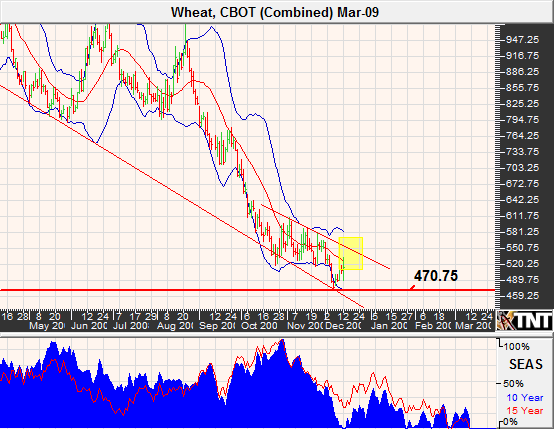 However, as the spread unwinds wheat prices will benefit as traders buy wheat and sell corn. A close above $5.24 suggests that a larger rally to $5.50 and maybe even $5.80 could be underway. However, we feel as though currency pressures and seasonal tendencies will eventually leadto a resumption of the downtrend. It is no secret that the U.S. economy is in one of the most profound recessions in history; accordingly, expectations for a contraction in world demand for oil seems to be the consensus. Likewise, the most recent EIA weekly inventory report shows that total product demand was down 6.2% and oil stocks are over 20 million barrels higher than last year leaving the fundamental picture bleak. OPEC threats to cut production for the third time have been essentially shrugged off by the market due to a lack of compliance from cartel members. Many of the current producers are beginning to see crude oil prices reaching their cost of production, which will eventually cause them to drop offline. However, it may take a larger move lower before this actually comes into play. In last month's newsletter, we suggested that a move to $49 was underway and if hit, crude oil would likely see $40 per barrel in "short order". We also noted that the previous $40 ceiling would become the new support. Now that we are here, our ability to gauge the next move has become questionable, as technical analysis and fundamental analysis seem to be in disagreement. However, we can't help but feel that the short covering will extend itself to $51.50 on the February contract and perhaps even $60.00 before resuming the downtrend. This conclusion is based on seasonal tendencies going into January along with technical projections. The "deflation story" has kept metals prices under wraps; without it we may have seen a surprisingly large rally in precious metals. Instead, we are left with relatively directionless trade. 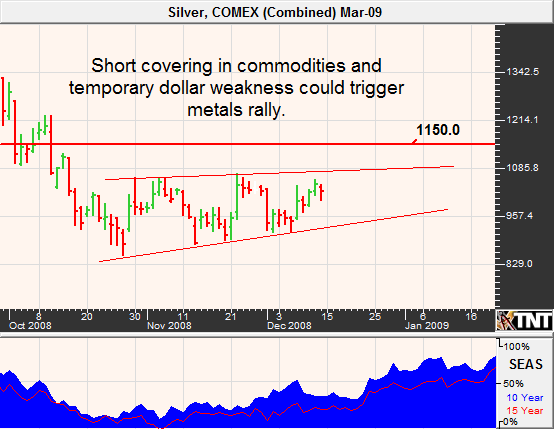 We believe that longer-term fundamentals will keep metals prices well below their 2008 highs but see potential for a temporary rally on the heels of a continued dollar correction and short covering in many of the other commodities. Keep in mind that with the relentless metals rally in recent years, gold excavation has become less efficient. Less disciplined production was rewarded with prices high enough to cover costs and led to a dramatic increase in producer costs (this same phenomenon occurred in the energy sector). Gold production costs have risen from about $160 per ounce in 2001 to over $400 per ounce in 2008 and production is expected to be down 3% in 2008 and 5% in 2009. We are looking for February gold to trade just under $900 in the coming weeks but feel as though the rally will fizzle out at such levels. Silver on the other hand, will face significant resistance near $10.80 but a move to $11.50 may be in the cards should the dollar weakness continue and the other commodities find footing. The U.S. greenback has fallen out of favor once again as traders are speculating on the length of time in which the Fed will keep rates under 1%. The futures markets and many analysts were looking for a Fed Funds target rate of 50 to 75 basis points through the first half of 2009 and currency traders worry that this will keep dollar demand low. However, it is obvious that rate cuts have been global in nature and the interest rate differential on any given currency pair may be minimal. Recent news of larger than expected imports kept gave the bears an edge leaving us to believe that the dollar may be headed lower in the near term. In the most recent DeCarley Perspective, we noted that 88.56 marked heavy resistance, in the meant time the December future managed to hold technical levels and trade below our target of 84 and is approaching our second support level near 79. However, this time we are singing a different tune. While we agree that the dollar selling may ensue in the near term, we think that the March Dollar Index futures will trade lower to find support near 81.50/81.00. After all, seasonal tendencies suggest that the weakness should carry through the month of December and possibly into the first week of January. At such levels, the index may become an attractive long side play via long futures in combination with protective puts or simply long calls. Aggressive traders may be comfortable simply going long from similar prices. After suffering an extended decline, the Euro is finally enjoying a short covering rally. While Euro zone fundamentals are weak, so are those of the U.S. Accordingly, the Euro and dollar speculators are dueling over which is currency is "less bad". ...looking for a digestion to ensue that would bring the value of the Euro back to the 138 area before continuing to make its way lower. Keep in mind that the move may not occur until later in the month. In the meantime, the December Euro should find resistance near 131.80 and support at 123.72. This time around, the move to what we believe will extend to about 138.00 in the Euro is underway (a little later than originally expected). 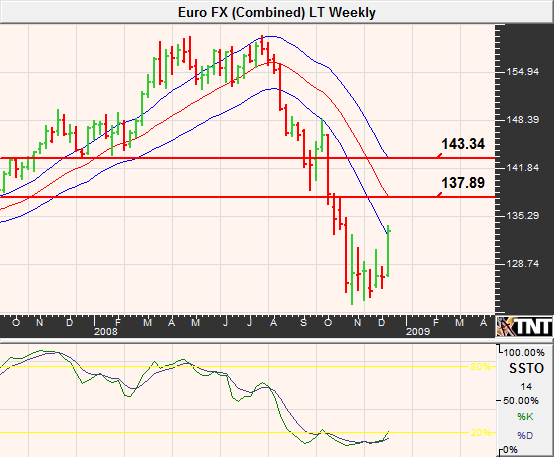 We are looking for resistance levels to hold, and for the Euro to retreat into the mid to low 120's. However, if we are underestimating the fundamental climate and the amount of short covering that could take place, the next major area of resistance will likely be found near 143.30. With that said, in the very near term the March Euro futures seem to be slightly overbought and may trade down to 127.73 as the rally digests. The British Pound has been consistently "pounded" in the later part of 2008 after spending the first two quarters in a relatively narrow trading range. Despite promising action in recent weeks suggesting that the lows are in, the trend remains bearish and we seem to simply be in corrective mode. Like most other nations, England suffers from dismal economic fundamentals. However, according to the European Commission, the U.K. will suffer the most from the financial crisis. Additionally, the Bank of England has lowered its rates to the lowest levels seen since 1951. While we think that it is possible to a retreat to the 2001 lows in the high 130's, the market seems primed for a temporary bounce. However, the recent highs near 155.50 may keep the upside limited for now; although there is potential for a massive short covering squeeze near 170.00 without violating the downtrend. As calm as this market may seem, it looks to be a high-risk proposition as a big break-out could be looming. Sugar has been plagued by the "commodity curse" of 2008 but has managed to find a trading range in the most recent nine weeks. 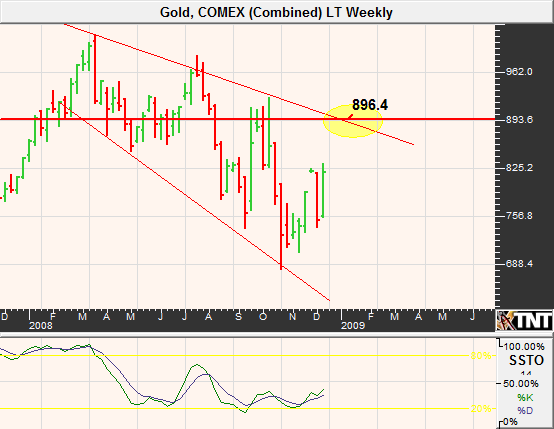 The market's inclination to become range bound suggests that there may be some positive trade ahead. While sugar prices have been closely tied to crude oil, sugar failed to see the depths that the energy markets have experienced. Some of the strength, perhaps lack of weakness would be a better description, can be attributed to the mid November USDA announcement that predicts that the 2008/2009 world sugar production will be considerably lower than the previous year. However, fundamentalists will tell you to expect revisions, as it is commonplace for the USDA to do so. Additionally, although the ethanol hype has died down considerably it is still in the back of the minds of many sugar traders. In fact, Brazil has predicted that ethanol production in 2008/2009 would be up over 17%. Keep in mind that much earlier this year, sugar giant Czarnikow stated that 10 cents per pound was "well below production costs." Our prediction was slightly pre-mature, but the market did recover to 13 cents only to succumb to selling pressure once again. However, our assumption that the subsequent selling could bring prices below 10 cents has been adjusted somewhat. We now expect the March sugar contract to find a low near 10.50 with 10.00 being a possibility but not an expectation. Sugar prices are facing significant technical resistance in which it may have difficulty overcoming immediately. We expect to see a moderate retracement in the near term bringing the price of March sugar back into the trading range and eventually to retest 10.50. However, seasonal pressures, rising demand in Brazil for ethanol along with declining ethanol stocks could put a floor under pricing. A futures trader may look to enter the market at 10.50 with the intention of risking it down to a little under 10 cents. Due to low levels of volatility, simple long option strategies seem to be the most efficient means of playing this market. Strangles may even be a possibility given the premise that a break above 12 cents could fuel a meaning full rally and a break below 10 cents could lead to a large technical plunge. Despite massive closures of high priced coffee venues, the caffeine oriented beverage remains in high demand. In fact, during recessionary periods there typically isn't a significant decline in demand for coffee; some may even argue that consumption increases during such times. 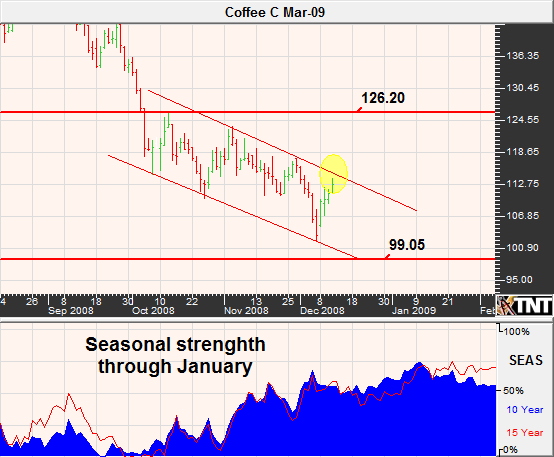 Nonetheless, global economic concerns and ample supplies have kept coffee prices under pressure. Analysts note that reduced crop production in Brazil and Vietnam could pave the way for a significant rally in 2009 but point out that buyers could be reluctant in the near term. However, COT data released through December 5th, suggests that high speculative short positions leave the market vulnerable to a swift short covering rally. 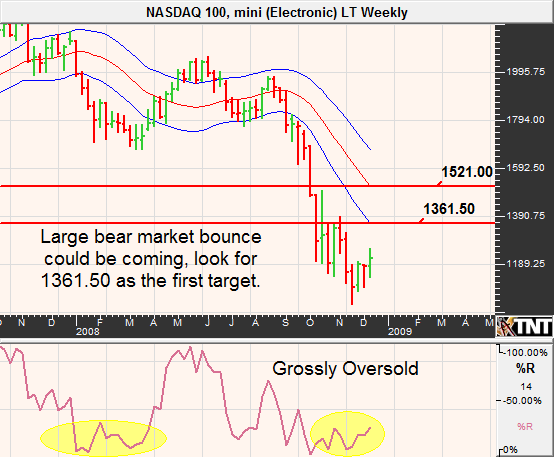 However, the daily chart suggests that the move occurring last week may have been "it" for the bulls...at least for now. It seems as though March coffee could be headed for a test of the $1 area before finding a more reliable bottom as the current down trend channel may prevent immediate gains. 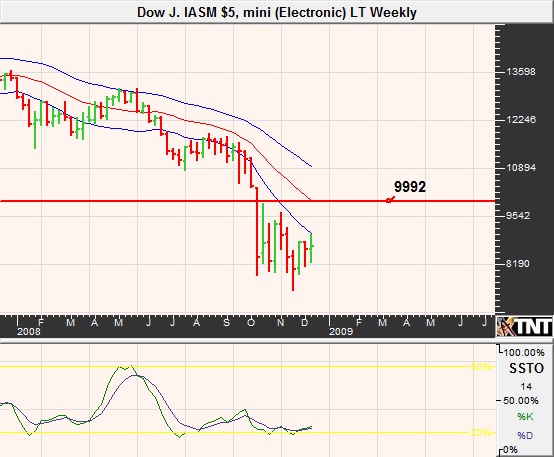 Bulls should look for lower prices to begin contemplating the long side of this market. Coffee is a high stakes market, the options are expensive and the futures margins are high. Before entering this market, make sure that you are able to tolerate the risk involved. 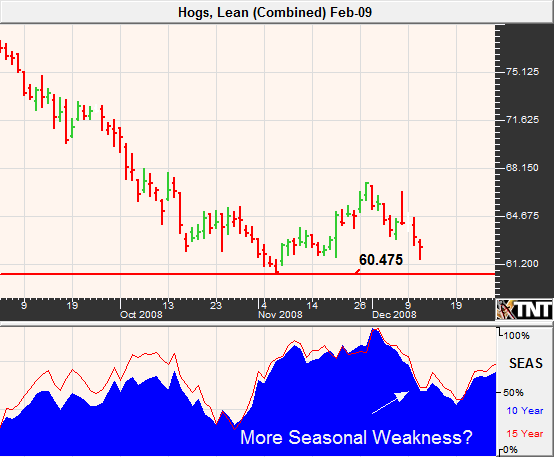 Lean hog futures have fallen victim to recessionary demand in both the retail and restaurant sectors. Naturally, as Americans pinch their wallets one of the first cutbacks is eating out and another is the switch from proteins to carbs which are much cheaper. I do not proclaim to be an expert in meat trading, but I have been around long enough to experience the resiliency of a trend. The meats are notorious for trending extremely well and for long periods of time. While hog prices look to have found a bottom in the near term, the trend is still decisively lower. Accordingly, bulls will likely have the opportunity to enter the market at better levels. 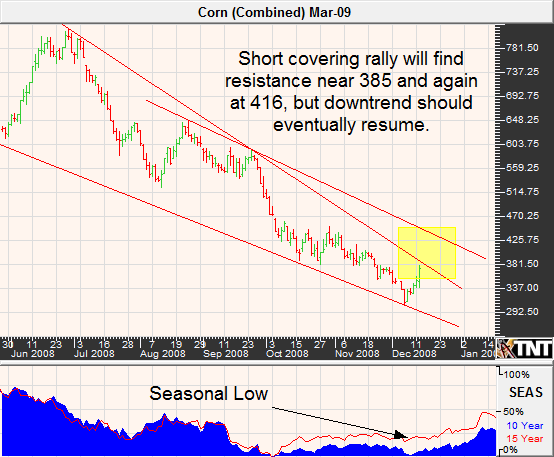 If broken, the recent low of nearly 60 cents may give way to trade in the mid to low 50's. Prices may seem cheap now, but that doesn't mean that they can't get cheaper. Like equity traders, cattle traders have priced in a near worst case scenario in terms of demand for beef. However, there are a few positive fundamentals on the horizon. First, US beef may regain some market share lost in Asia following the mad cow scare three years ago. Additionally, a sharp drop in poultry production could create a scenario in which beef is competitively priced. All the meanwhile, supplies look to be shrinking. If this premise is accurate, exports and local demand for cattle products should increase somewhat considerably in the coming weeks. In the previous newsletter, we noted that cattle prices were in the process of retesting the October lows. We now know that the October lows gave way to new lows and the trend remains determinedly lower. With that said, it is not uncommon to find a mid-December low in cattle but we believe that the seasonal bounce will be a bit late this year. 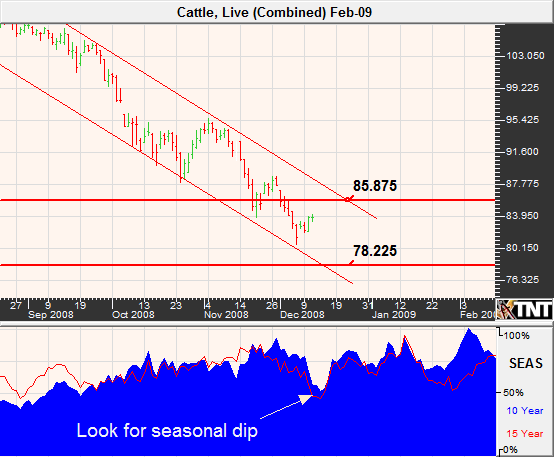 Look for better levels to be bullish live cattle. We see support at 80.50 and again at 78.20. Conservative traders should wait for prices in the 70's to begin considering a bullish stance. In fact, 74 isn't out of the question. This is near the level seen in the 2006 meat downturn. As mentioned, meat futures can and will trend longer than many can stay solvent.